Tracing the life of a renowned icon painter, the second feature by Andrei Tarkovsky vividly conjures the murky world of medieval Russia. This dreamlike and remarkably tactile film follows Andrei Rublev as he passes through a series of poetically linked scenes—snow falls inside an unfinished church, naked pagans stream through a thicket during a torchlit ritual, a boy oversees the clearing away of muddy earth for the forging of a gigantic bell—gradually emerging as a man struggling mightily to preserve his creative and religious integrity. Appearing here in the director's preferred 185-minute cut as well as the version that was originally suppressed by Soviet authorities, the masterwork Andrei Rublev is one of Tarkovsky's most revered films, an arresting meditation on art, faith, and endurance. ando wrote: Shame the old thread is gone for good - some of my favorite discussions were contained therein. It's also strange that this film is rarely seen on cable or satellite television. Actually, I've never seen it on television. My first viewing was the result of a rental from a now defunct West Coast Video but its been my favorite film ever since. I've yet to view all of Tarkovsky's work but I'd imagine that it would be hard to equal the breadth of vision in Andrei Rublev. I suppose The Sacrifice is my next Tarkovsky film to view. It will be interesting to see if he was grappling with the same artistic and/or human questions that he considered in Rublev and/or if he was able to take these considerations any further. Rublev is my pick for Tarkovsky's best (and my personal overall favorite), though Mirror is a close second. Rublev is vast, gorgeous, and lyrical in ways that at times defy description. I strongly recommend watching it with the subtitles off once you're reasonably familiar with what's happening. For me, watching Rublev is a form of meditation. Mirror is as intimate as Rublev is vast. Mirror is technically not as consistently breathtaking as Rublev, but it's downright jaw-dropping once you're comfortable with it's structure. I recommend Mirror over The Sacrifice, though I know others feel differently. Your enjoyment of The Sacrifice may depend on the extent of your willingness to accept Tarkovsky's metaphysics, which by the end of his career were a bit too heavy-handed for me, as an atheist, to take. How does one pronounce "Roublev"? To that, just add a faint "yo" or "io" after the "bl" of "bluff". Very quickly passed over. The letter between the L and the V in the original Cyrillic is pronounced "yo" (with the 'o' short as in 'hot' or 'yacht', not as in 'yo mama'), but in normal speech, when it's not stressed (as here), the 'o' tends to disappear into a generalised vowelish grunt (for the linguistically inclined, think schwa) - the sort of proto-vowel you find at the end of 'sofa', the beginning of 'enough', the middle of 'edible'. The stress should be on the first syllable. The opening 'r' should be slightly rolled, the 'oo' not too long. Last edited by zedz on Thu Dec 30, 2004 7:43 pm, edited 1 time in total. I like this thread. It has criterionforum.org written all over it. there the title is spelled: "Andrej Rubljow" - which is another story. I really don't mean that as sarcastic as it may sound, i'm just amused. 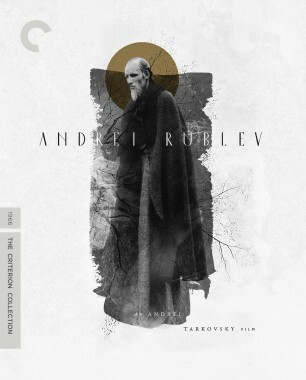 "Andrei Roublev" is certainley a beautiful film. Some images that stuck out for me the most was the scene in which Kiril first meets Theopanes- the expressions on their faces, the pace and atmosphere in that scene is breathtaking. And the 360 shot in the room at the beginning and the shot of the monks walking on one bank of the river with the guards and the jester on the other was fantastic. Quite an achievement. Yes, the jester is one of my favorite film characters. He gives the narrative a levity that (the character) Rublev sorely needed to encounter. One of the greatest acheivements of the film (for me) is the way in which Tarkovsky draws us into his panorama of human suffering without involving us personally. Looking at this film I don't feel personally implicated although I'm entirely involved. I suppose it's the closest thing to a compassionate rendereing (for instance) of The Passion Play that I've ever seen on film. Pasolini's (as well as that manlger, Mel Gibson's) approach can leave the viewer with a feeling of guilt or shame, particularly, with regard to one's own brutality or ignorance. None of this is engendered in Rublev. And it's not because of the film's detachment, necessarily, as it is its broader perspective. Certainly, the political and/or ideological perspectives are not nearly as pronounced in Rublev (with regard to The Passion Play) as The Gosepel According To Saint Matthew or The Passion of The Christ. I don't think I can wait for the possible re-issue of this title. But I wanted to be sure the subtitles are 16x9 friendly. If I remember correctly, they appear exlusively in the letterboxed area of the screen. Are they high up enough not to be cut off when the whole image is zoomed in to fill a 16x9 display? Denti, since the film is 2.35:1 the image will not fill a 16x9 screen - surely you don't intend to watch this as a 16x9 p&s. The subtitles do indeed appear only in the letterbox area below the image, but for me to see all of them on my 16x9, I must scroll the image up to the top of the screen. naturally, no. but I wanted to be sure the subs didn't get chopped when I zoom in properly. Of course I hadn't thought of shifting the image toward the top of the screen, which solves the problem, thanks. How likely is it that we'll see a new edition with a 16x9 transfer? Would it the 205-minute film be split over 2 discs next time around? At the risk of turning this into another Random Speculation Thread, if there's ever a rerelease it ought to include both "director's" cuts, which would probably require a Leopard-like 3 disc if there are any decent extras. he original RUBLEV producer is not with Criterion anymore (the DVD was a port from LD). It's really quite complicated, but it definitely needs some solid research to do this one properly again. The Criterion DVD version is very precious, and the version released by Ruscico and Artificial Eye is very, very different. Some scenes are different takes, some scenes are in completely different places (sometimes hours later), whole swathes of the film have Ovchinnikov music which are silent in the Criterion version... the jester's arse is missing in the Ruscico/AE, the horse spearing too, the 360 degree pan in the rainstorm is edited in half (because of the jester), etc, etc, etc. Having looked very closely at both versions simultaneously on two screens, I am of the (not widely held) belief that the Ruscico/AE version features a more advanced Tarkovsky edit of the film *but which has then been edited/censored by the Russian authorities*. There are many edits in the Ruscico/AE version that, I think it can be quite safely argued, Tarkovsky would not have made in a month of Sundays (all violence edits, the edit of the 360 degree pan because of the jester's arse, etc). Because of the censoring that goes on in the Ruscico/AE version, the Criterion edition is the version to watch but I would love to know if an uncensored version of the Ruscico/AE edit exists, and I would love to know more about the history of the Criterion/Scorsese version and the Ruscico/AE version. The main editor (Ludmila Feiginova) is no longer with us. I don't know about T. Yegorychova and O. Shevkunenko. Worth looking into. Yegorycheva is still with us. A friend talked to her last year. There seems to be a profound schism among Tarkovsky fans between those who rank at the top his post-Soviet work and those who prefer his earlier work, with Mirror serving as a kind of pivot. My personal feeling, after reading "Sculpting in Time," is that Tarkovsky's increasingly complex, personal religious purpose in his films made them increasingly inscrutable to those who don't share his belief. This is in no small part because Tarkovsky's religious belief isn't capable of simple analogy to modern popular Christianity, at least as it can be understood as an outsider. My response to Nostalghia is that the final "sacrifice" involving the candle is utterly ineffectual, a kind of madness. "The Sacrifice" is a more straightforward miracle film, and works better because of it - the madness of burning the house down is justified by the madness of the war's sudden reversal. Of course, Offret is also saddled with an incredibly dense script and a plot twist that needs to be seen a few times before it ever approaches comprehensibility. But Rublev's faith doesn't rely on miracles of faith - instead it relies on miracles of humanity, which someone who doesn't have a deep religious belief can relate to more easily. That the main characters are priests allows believers to see God, and non-believers to see Man. The same can be said for Ivan and Solaris, which tell entirely human stories. Mirror encapsulates that philosophical "something" that crosses into a religious aspect without explicitly doing so. Certain elements of it, especially the main character's sense of martyrdom, clearly have religious analogies, but the religious elements never consume the overriding theme of memory. Stalker took the religious element of Tarkovsky's filmmaking into a more obvious, if still not explicit, religious bent. The Stalker's character is clearly a Jesus figure, but the source of the story (it's science fiction elements) prevent the film from being explicitly religious. Tarkovsky's departure from the USSR allowed him to explore religious themes without concern for state censorship. It also coincided with his deepening and complex religious faith. I think this accounts for the differing opinions among his fans. I thought I had this movie (and hadn't watched it yet), but it happened that I had Salvatore Guilano (sp?) and mistook the two (similar colors, I guess)... And since I just lost my job, I can't get it for a while.... Thanks a lot guys! skuhn8 wrote: Amazing, such disparity in his admirers. Darn right. I'm really suprised this diversity existed among Tarkovsky fans, which makes it really interesting to have a discussion about it. So here's my contribution. bunuelian wrote: My personal feeling, after reading "Sculpting in Time," is that Tarkovsky's increasingly complex, personal religious purpose in his films made them increasingly inscrutable to those who don't share his belief. the feeling of void which is impossible to bear." Being an atheist or agnostic doesn’t mean you don’t need belief or faith, quite the contrary, more so I would say. But this religious (I think we absolutely can call it religious, since it deals with faith and beliefs) aspect of Tarkovsky’s film-making don’t tells us where to look or gives answers to those eternal questions (the existence of God etc. ), they show us people on a quest for something higher, something to believe in. So for me the religious philosophy that dominates much of Tarkovsky's later films isn't a trouble, even though I consider myself an agnostic. David wrote: Being an atheist or agnostic doesn’t mean you don’t need belief or faith, quite the contrary, more so I would say. But this religious (I think we absolutely can call it religious, since it deals with faith and beliefs) aspect of Tarkovsky’s film-making don’t tells us where to look or gives answers to those eternal questions (the existence of God etc. ), they show us people on a quest for something higher, something to believe in. Absolutely. I'm an agnostic, and Tarkovsky is by far my favorite filmmaker. Faith didn't always even mean faith in God for Tarkovsky himself. Somewhere (I think it's cited in The Films of Andrei Tarkovsky: A Visual Fugue) there's a quote by Tarkovsky, saying "For me, heaven is empty." Now, I'm sure, like a lot of artists he changed his mind about this over the course of his life, and reading Sculpting in Time and watching his later films I would imagine he had some sort of belief in God at the end of his life, but clearly faith in his films can also be seen as faith in humanity or in art. Tarkovsky certainly believed in an afterlife: for much of his working life he was spooked by the appearance of the spirit of Boris Pasternak at a seance in the late sixties who predicted that he would only complete six more films. As far as this ranking discussion goes, I don't really favour late or early period particularly, my least favourite features being Solaris and The Sacrifice (which has always seemed to me too much like a slavish Bergman tribute). And I think that any religious reading of the films needs to take account of the careful ambiguity of Tarkovsky's miracles. Is the glass at the end of Stalker being moved by telekinesis, or by the vibration of that train? No one is questioning that Tarkovsky was a Christian. The questions here involve his relationship to his faith, its evolving impact on his films, the philosophical aspects of his religious beliefs, and the relationship viewers from different religious perspectives have with his films of different eras. It is abundantly clear that the character of Tarkovsky's Christianity bears almost no resemblance to "typical" American Christian belief and experience. I'm completely ignorant about Eastern Orthodox traditions, but I feel it isn't unreasonable to say that those traditions, separated as they were from western European Christianity, developed along a different path and resulted in a different kind of religious perspective. I'm sure living under the Soviet regime also profoundly impacted his relationship to his faith. Was there a community of believers where he grew up and where he lived as an adult? Was there a church to go to? Sunday School? Did his entire life revolve around the church? Etc. Saying, "He was Christian, and his films were Christian" simplistically assumes that the concept "Christian" has a unified meaning, and doesn't tell us anything about Tarkovsky or his films. I'm an atheist, but I have great respect for Tarkovsky's beliefs and his meditations upon them. I agree that Stalker is about the importance of belief of some kind in a dark and painful world. I disagree about Nostalghia and Offret, though. Nostalghia's opening scene sets up the chasm between modern atheism and traditional religious belief. The translator demonstrates how someone without a foundation of belief "goes crazy" by trying to cling to other people. The main character's adoption of the religious ritual at the end, with the candle representing his soul, is expressing more than just that belief in something matters - for me, it's expressing that belief in a soul, and a higher power, are important. Isn't his "death" a kind of parable for the mortal soul? This clearly has a religious meaning. Offret is even more religious. He makes a deal with God. God comes through. His actions seem crazy to everyone else, but he joyously rides off with the conviction that God exists, has heard him, and has responded. The film begins with that long setup about the non-believing modern man. The protagonist "wins" in the end because of his belief in God. This is not just belief in "something." It's very specific. Vida T. Johnson and Graham Petrie wrote: In the interviews that he gave around the time of making this film, Tarkovsky seemed more concerned with attacking the spiritual emptiness of contemporary society in general than with proposing specifically Christian remedies, and he even told Marcel Martin, "For me the sky [heaven] is empty," and that he did not have the "organ" that would enable him to experience God." Again, I'm not saying this represents his beliefs over the entire course of his career (and I think bunuelian's analyses of Nostalghia and Offret are very insightful), but to say "Tarkovsky was a Christian," end of story, as if that's representative of his beliefs over the entire course of his life is simply not true. Atheism means one believes there is no god, or that one doesn't believe there is a god (two sides of the same coin, but distinct sides nonetheless). It has nothing to do with one's opinion about the beliefs of others. That many atheists adopt an uncompromising, arrogant and disrespectful attitude toward religious belief misses the important fact that belief exists and has power. In my view, this is an entirely human, psychological phenomenon with no external divinity, but is nonetheless fascinating and important. PoetWarrior, if you have something substantive to share on the topic as it relates to Tarkovsky I'd like to see it. If you want to avoid the troll stigma, you'll return the favor of putting thought into posts. Faith isn't the issue here - it's dogma that we abhor.